Firstly, a 40+ year old unit likely doesn't need "repaired". It NEEDS a complete refurbishment / restoration. Most 'vintage electronics' has likely 'sat around' in some closet, basement, crawlspace, attic etc for the last 20+ years. In some rare instances, the gear may never even been taken out of the box since new. This is NOT a 'good thing'. Lot's of vintage gear have 'lubes' and 'rubber parts' in them. Lubes stop being "lubes" and start becoming 'glues'. Rubber can do a number of things with time. It can 'glaze over' (think the pencil eraser you put in a drawer, then a year or two later, it's all 'slick' and simply glides across the paper without erasing anything), it can harden (and in the case of a belt may permanently take on the shape of the pulleys it's going around in a state of 'atrophy'), it can crack / disintegrate, or depending on how it was originally vulcanized, it can revert back to it's natural state of 'liquid goo' leaving a 'tar like' substance on everything it has touched inside or on the unit. While not as prevalent of an issue, capacitors will be 'dried up' to a degree or may have leaked in a number of places as well. Heaven forbid there were any sort of 'batteries' in the unit (think 'memory back-up for tuners), as they will likely have leaked out (not a common issue, as few units will have need for batteries). Thus we want technicians to be speaking in terms of 'restoration / full refurbishment' instead of 'repair'. You don't pull a '57 Chevy out of a barn after sitting for the last 30 days with the intention of 'repairing' it for a trip across the country tomorrow. You "RESTORE" / "Refurbish" it! Secondly, just being a 'repair' shop or electronics technician or having a 'double E' doesn't make one person an 'expert' in ALL things electronics. In medicine you have a "GP", but he will have a rolodex of 'Specialists' to refer to for specific tasks that are 'above is station / comfort zone'. Some of those "Specialists", may have even more 'Specialized' experts to refer to. Just being an auto-mechanic doesn't mean that a person can work on 'anything'. There are specialized shops for 'transmissions', 'electrical', 'tires', 'exhaust', 'suspension', 'frame straightening', 'body shops' and MANY others. A mechanic that knows how to work on a 'late model' car blindfolded, might 'scratch his or her head' if presented with a '39 Ford Coupe. Conversely, the person that can completely 'tear down' the " 1939 Coupe" to it's last nut and bolt, then reassemble it, maybe even better than new, would likely be totally lost with today's computerized, 'fly by wire' cars. And let's not even mention 'Tesla'. Having said that, it's not realistic to assume that ANY repair shop can handle ANY repair / restoration / refurb. Everyone has their 'specialty' / 'area of interest', so when choosing a shop to have your 'vintage stereo unit' brought back to life, call / contact quite a few, to 'feel them out' and make your own determination as to who you feel is the best candidate to handle the restoration of your valuable, vintage audio gear. Professional Audio - Video - Computer Diagnostics and Repairs. Audio Wizard started in 1976 in the Scottsdale area. All major brands of consumer electronics products and most vintage audio and video equipment can be repaired at Audio Wizard. We specialize in Audio, Video and Computer Repairs and also repair, Plasma, LCD / LED, DLP TV's, Recent and Vintage Audio equipment, Tube Gear, Guitar amplifiers, Pro-Audio / PA Gear, Open Reel and Cassette Tape decks, VCR's and Wireless mics. We repair Professional Audio and Video equipment as well. We also repair Vintage audio and Vintage car / mobile Audio products. Complete optimization, and cleaning and alignment of the system is performed for each repair. They specialize in repair of modern and vintage audio / video electronics and stereo gear such as Reel to Reels, Turntables, Cassette Decks, 8-Tracks, Amps, Receivers, Tuner Alignments, Tube gear, Guitar amps, Pro audio, Tube radio repairs / restoration, VCR�s, DVC Player�s, TV�s, Short Wave, CB & Ham radio equipment. (an email testimonial we received regarding Electrotech Service; "Dear Oak Tree Enterprises: I am writing to thank you for putting on your website reference to them in Costa Mesa, California, as a place where one might obtain reel-to-reel recorder repair and refurbishment. I picked up my vintage Akai GX-260D yesterday (it weighs a ton) from them; and, am currently listening to one of my pre-recorded tapes Dolby tapes with great pleasure. I must mention George" (from Bulgaria) who was the technician who repaired my deck. Despite his accent it was clear I was speaking with a person with a passion for keeping such equipment operational. My deck has never run better (it was obtained used in the early '80s). I would have never found them had it not been for your professionalism in placing their contact information on your website. Thank you again. Sincerely, John W., Long Beach, CA)"
We repair under warranty Audio Research. We are recommended by Conrad/ Johnson, McCormack Audio. We also service Quad, Spendor, Air Tight, McIntosh, Marantz, H.H. Scott, Fisher, Gradient, Linn, Jadis, Pass Labs, MFA, Jeff Rowland and many more products. A general 'refurbishment' is included with most service jobs. They can also perform 'upgrades' to existing equipment. Also service most fine turntables and replace cartridges and styli. We are located minutes from LAX airport in Culver City, California. They specialize in repair of modern and vintage, solid state and tube, audio electronics and stereo gear such as some Reel to Reels, Turntables, some Cassette Decks, 8-Tracks, Amps, Receivers, Tuners, Tube gear, Guitar amps, Pro audio, Tube radio repairs / restoration, some Speaker Repair, Some Short Wave, CB & Ham radio equipment, Jukeboxes, and Console Stereos. They can / may offer house-call / delivery / pick-up of your larger items such as jukeboxes and console stereos. Since 1974! From their website, "The best equipped, professionally staffed repair facility in the San Francisco Bay Area with the largest and varied parts department, and service manual library in the business for new and old audio and video equipment, consumer and professional. Complete audio and video repair and calibration on all makes and models. Installation, house and field services available on all products serviced. We service professional, commercial, and consumer equipment from the oldest vacuum tube equipment to the latest state-of-the-art equipment" They can / may offer house-call / delivery / pick-up of your larger items such as console stereos. They specialize in repair of modern and vintage, solid state and tube, audio electronics and stereo gear such as some Reel to Reels, Turntables, some Cassette Decks, 8-Tracks, Amps, Receivers, Tuners, Tube gear, DAT decks, CD and DVD players, Guitar amps, Pro audio, Tube radio repairs / restoration, some Speaker Repair, and Console Stereos. Servicing Stereo Receivers, Amplifiers, Guitar Amps, Tuners, EQs, Turntables, Cassette Decks, Reel to Reels, Speaker re-coning / re-foaming, Tube Radio Repair. Also most video gear; TV's, Flat Screens, VCR's & DVD's. Specialize in Tube Equipment by brands such as; Air Tight, Altec, Audio Research, Blue-Ox, Dynaco, Fisher, Fourier Components, Golden Tube Audio Graaf OTL, Heathkit, Jolida, Harmon Kardon, Marantz, McIntosh, PS Audio, Scott, Sonic Frontier, Tenor OTL, VTL and most others. Since 1992 offering repairs of Television, Radio, Video Camera, VCR and Stereos, as well as computer repair. Mobile capable for in-home house calls / on-site / repairs. See their web site for more details. Norm at 'Norbern Electronics has been the 'Go-To' guy in Colorado Springs for 'Solid' electronics repairs for many years. We and many of our consignors have used them with near flawless results. Norm 'gets it right' and his repairs are a great VALUE. Norbern Electronics specializes in repair of both modern and vintage audio electronics / stereo gear such as Reel to Reels, Turntables, Cassette Decks, 8-Tracks, Amps, Receivers, CD Players and Changers, Tuner Alignments, Tube gear, Powered Subwoofer repairs, Guitar amps, Pro audio & Tube radio repairs / restoration. They are also versed in the repair of Bose 'Wave Radio's' & CD players, They are a warranty service center for many brands such as Denon, Onkyo, Parasound & Pioneer, and specialize in Bose and Carver (it is very difficult to find someone who knows Carver well.) They have a service manual library in excess of 45,000 pieces. They also specialize in units damaged by lightening. (It is difficult to find technicians willing to address lightening damage to electronics.) They are able to accept and turn-around 'Shipped-In' units. See their web site for more details. 1845 N. Circle Dr. (In the North Circle Plaza) Colorado Springs, CO 80909 Office: 719-630-3533 Ross and his crew have been repairing electronics for over 30 years. I actually used his services on MANY occasions, years ago, when I worked at a 'full line' music / pro-audio store, "The Colorado Springs Music Company". He was our technician for years. Certainly versed in most repairs on 'vintage / classic' audio / stereo equipment. See their web site for more details. These guys can handle most consumer Modern and most importantly, 'Vintage' Stereo Repair, Home Theater Receiver Repairs, CD players and recorders. They also do repairs on turntables, both vintage and modern. Are able to handle 'shipped in' repairs. We specialize in high end and vintage audio equipment repair and restoration. We can repair and restore your high end audio equipment. Items can be carried in or shipped in; VINTAGE AUDIO REPAIR; Original OSRAM / Philips Lamps; Computer / Laptop Repair, Hardware / Software, Restoring, Malware Removal. Specializing in Vintage audio / Stereo repairs. They can repair vintage receivers, amplifiers, tuners, cassette tape decks, turntables, EQ�s and most older stereo / audio gear. Solid State or Tube equipment. They may even be able to fix your old console stereo. Shipped in repairs possible, but contact them first. Martroy Electronics, Inc. offers Repairs and sales of New and Vintage consumer audio and video gear such as Reel to Reel tape decks, receivers, amplifiers, tuners, turntables, cassette decks, CD players, DVD players and flat panel TV's. They can also repair older VCR's both Beta and VHS. They can repair antique / vintage tube radios as well as handle most 'tube audio' repairs. They are also a warranty repair station for Teac and McIntosh Audio / Stereo equipment. Specializing in repair & 'Restoration' of vintage & more recent, consumer & 'Pro' electronics and stereo gear such as Tape Decks, Reel to Reels, Turntables, Cassette Decks, 8-Tracks, Amps, Receivers, CD player & DVD repair, Tuner Alignments, Tube audio repairs, Tube radio repair and restoration, speaker re-foaming and re-coning. They can replace and re-bias tubes in your guitar amp, new or vintage. They also do design and installation of commercial sound systems for churches, schools, auditoriums and similar facilities. 'KC Stereo Repair' also provides expert design and installation of home theater systems, including media servers, sound processors, amplifiers, speakers and inside wiring. They also accept 'shipped-in' repairs (contact them first). Sunny Electronics offers Repairs of New and Vintage consumer audio and video gear, but not so much 'electro-mechanical' units such as turntables, VCR's or tape decks. Primarily receivers, tuners, amplifiers...things that don't have 'moving parts'. They are versed in servicing the following items and more: Power Amplifiers - DJ turntables & CD players - Karaoke machines - Receivers - DVD - Home Theater Systems - Cassette Decks - Turntables - Tube Amps - Compact Disc - Laser Disc Players. We are authorized to service the following manufacturers of �Consumer Electronics�: Denon - Harman/Kardon - Infinity - Integra - JBL - Kenwood - Marantz - Musical Fidelity - NAD - Onkyo - Panasonic - Parasound - Pioneer - Teac - Yamaha. They have serviced over 550 manufacturers! They back their repairs with a warranty. See their website for details and further contact info. They have been servicing audio and video gear since the mid 1950's! Well versed in just about everything electronic, from vintage tube to modern digital. Repair of vintage & more recent, consumer & 'Pro' electronics and stereo gear such as Tape Decks, Reel to Reels, Turntables, Cassette Decks, 8-Tracks, Amps, Receivers & CD players. Can offer home pickup (especially handy for 'console stereo repairs'). They are also able to do 'shipped in' repairs. You will need to contact them first before sending anything for repair to get an idea if they want to 'tackle' it. After years in the biz, The folks at ''Birmingham Television Co., Inc" are able to do repairs on most types of classic / vintage audio as well as modern 'mid-Fi', 'Hi-Fi' and 'Audiophile' AUDIO gear including CD players, DAT decks etc and video gear such as repairing Beta and VHS VCR'S and Video Laser Disc players. They can also repair and do some restoration work on Juke Boxes. They are also able to work / repair console stereos with pick-up and / or house call service available. Member of NESDA. Servicing / Repairing Stereo Receivers, Amplifiers, Guitar Amps, Tuners, EQs, Turntables, Cassette Decks, Reel to Reels, Speaker re-coning / re-foaming, and most consumer audio equipment. Also service Video gear such as Beta VCR's, VHS as well as TV's, Flat Screens and DVD players. Also repair / service Pro-Audio / PA gear, guitars and keyboards / synthesizers. They can even service film projectors. After 72 years in the biz, The folks at ''Northern-TV' shop are able to do repairs on most types of classic / vintage audio as well as modern 'mid-Fi', 'Hi-Fi' and 'Audiophile' AUDIO gear including CD players, DAT decks etc. Servicing / Repairing Stereo Receivers, Amplifiers, Tuners, EQs, Turntables, Cassette Decks, Reel to Reels, and most 'quality / vintage' and 'recent' consumer audio equipment. Solid State / Transistor or TUBE gear! Also service Video gear such as Beta VCR's, VHS as well as TV's, Flat Screens and DVD players. In some instances, they can do local pick-up / delivery. They can typically accept 'shipped in' units for repairs. Contact them first. Mike at Sound Advice has been working with 'Vintage Audio' gear before it was "Vintage", starting in the late 1960's. Servicing / Repairing Stereo Receivers, Amplifiers, Guitar Amps, Tuners, EQs, Turntables, Cassette Decks, Reel to Reels, Speaker re-coning / re-foaming, and most 'quality / vintage' consumer audio equipment. In some instances, they can do local 'house calls' / pick-up / delivery. They may be able to accept 'shipped in' units for repairs. Contact them first. Minnesota, Lakeville "Pro Audio Service" www.pro-audioservice.com Specializes in Pro Reel to Reel tape deck repair / restoration. Also Vintage 2-Channel Audio. They offer repair to; Stereo / Hi-Fi gear including; Audio Speakers , Power Amplifiers and Pre-Amps, Stereo FM Receivers, Reel to Reels, Tuners Repair, Turntables, Tape Decks, Video Game Consoles Repair, High End Digital Stereo Equipment Repair, And Much More.. by brands such as; Pioneer, Marantz , MacIntosh , Sony , Dual, Sansue, Akai,Bang & Olufsen, Crown, Denon, Dual, Fisher, Garrard, Harmon Kardon, Hitachi, JVC, Klipsch, Kenwood, Luxmman, Magnavox, Nakamichi, Numark, NEC, Onkyo, Panasonic, Phasw Linear, Phillips, Polk, RCA, Rotel, Sansui, Sanyo, Sherwood, Sony, Studer, Tanberg, Tascam, Teac, Technics, Thorens, & Yamaha. Missouri, Overland Park / K.C. "The Electronic Center / K.C. Stereo Repair" www.kcstereorepair.com 7113 W 79th | Overland Park, KS 66204 PH: 913-649-5000 "They have been servicing stereo / audio / video gear for over 30 years! Experienced in repair of vintage electronics repair in the Kansas City metro area. Repair services & restoration of vintage, classics, stereo receivers, power amps, pre amps, turntables, record players, cassette players and recorders, equalizers, speaker repair, reel to reels, tape recorders, guitar amps, solid state and tube gear, CD players, Hi-End audio and even vintage console stereos." Vinyl Renaissance & Audio offers Repairs and sales of New and Vintage consumer audio and video gear such as Reel to Reel tape decks, receivers, amplifiers, tuners, turntables, cassette decks. Vinyl Renaissance provides authorized repair service for all Denon, Marantz, McIntosh Labs, Music Hall, Creek, Shanling and Thorens products. Repair service is available for other brands of amplifiers, speakers, tuners, tape decks and processors. They may be able to accept 'shipped in' units for repairs. Contact them first for an RA or see their website for details. Since 1969, Millard Electronics, Inc. offers Repairs and sales of New and Vintage consumer audio and video gear such as Reel to Reel tape decks, receivers, amplifiers, tuners, Tuner Alignments, turntables, cassette decks, CD players etc. Both Solid State and Tube audio Repairs, Modern and Vintage. We also repair Vintage audio and Vintage car / mobile Audio products. They also accept 'shipped-in' repairs (contact them first). Third party Extended Warranty / service plans warranty work for IDS/AON - Assurant, Best Buys ESP - GE - Federal, K-marts Smart Plan - N.E.W. Philips Extended Warranty, Sam's Club ESP - Sony Partnership, Thompson Consumer Electronics, Video Aid - WaCa - Warrantech, Zenith Extended Protection See their web site for details. Repair, modification and restoration of antique, vintage and modern audio and video equipment including Receivers, Tuners, Tape Decks - Cassettes, Reel to Reel and 8-Track, DVD and CD Players, Amplifiers, Speakers, Radios, TV, Turntables, Projectors & Car Stereo. Able to accept 'shipped-in' repairs. Repair & possible modification of vintage and modern audio and video equipment. From their website, "David has an impressive resume with decades of experience as a technician of audio and video equipment....In addition to servicing all types and brands of equipment, Dave has a knack for coming up with improvements and modifications for a variety of equipment, including both tube and transistor products". Contact them via their website for specifics. TelRad Service repairs recent and 'Vintage' electronics, offering service on most Vintage Stereo / Audio, AV, and Video gear from the 'old to new'. They can handle most levels of 'repair' and some restoration on gear, including receivers, amplifiers, power amplifiers, pre-amps, tuners, Cassette Decks, turntables, Reel-to-Reel tape decks, tube amp biasing for vintage & modern 'Mid-Fi' audio as well as tube radio repair. Some of the vintage units they have repaired are Fisher 800 tube receivers and Sansui 9090 stereo receivers. They are McIntosh capable which should tell you their level of quality. They sometimes have 'pick-up' available to service that old console stereo as well. They also specialize in 'Ham' radio / amateur radio equipment repairs. 'Shipped-In' repairs are also possible with advance notice. Speaker re-foaming / repair available as well. G.E.H. Electronics Service repairs recent and 'Vintage' electronics, offering service to the Wilson / Buffalo area. They can accept 'shipped in' repairs as well as 'walk-ins' with appointment. They are able to repair most modern and vintage audio including receivers, tuners, amplifiers, equalizers and tape decks. Solid state or Tube equipment repairs / service. CD and DVD players repaired as well. �Volume Electronics, LLC� We repair all makes and models and offer repairs on both recent and 'Vintage' electronics. Servicing most Vintage Stereo / Audio, AV, and Video gear from the 'old to new'. They can handle most levels of 'repair' and some restoration on gear, including receivers, amplifiers, power amplifiers, pre-amps, tuners, Cassette Decks, turntables, Reel-to-Reel tape decks, tube amp biasing for vintage & modern 'Mid-Fi' audio repair. Lightening strike repairs as well. 'Shipped-In' repairs are also possible with advance notice. The folks at 'The AudioWright Shop' shop are able to do repairs on most types of classic / vintage audio as well as modern 'mid-Fi', 'Hi-Fi' and 'Audiophile' AUDIO gear. They are currently an Authorized Service Center for a select group of manufacturers and a mid-west regional Authorized Service depot for another high-end audio manufacturer. They are located in Columbus, Ohio serving the Central Ohio area. They also accept repairs shipped to our location from anywhere in the United States. They also make 'house calls' for electronic service, so no need to lug that console stereo in. We have over 75 years of combined experience between us. We do repairs on Home audio electronics, tape decks / recorders including 8-tracks and cassette decks, receivers, amp / amplifiers, pre-amps, turntables, tuners etc. User replaceable parts sales: belts for tape decks (8-track belts, cassette deck belts, reel to reel belts), phono cartridges and styli, audio cables, electronic vacuum tubes and phonograph record / stylus cleaning brushes and fluid. �Classic Sound Repair� Service repairs recent and 'Vintage' electronics, offering service on most Vintage Stereo / Audio, AV, and Video gear from the 'old to new'. They can handle most levels of 'repair' and some restoration on gear, including receivers, amplifiers, power amplifiers, pre-amps, tuners, Cassette Decks, turntables, Reel-to-Reel tape decks, tube amp biasing for vintage & modern 'Mid-Fi' audio as well as tube radio repair. They sometimes have �house-call� / 'pick-up' available to service that old console stereo as well. 'Shipped-In' repairs are also possible with advance notice. Full-Line electronics / appliance service center since 1936! Servicing most consumer electronics audio and video equipment both new, recent and vintage. Repairing Stereo Receivers, Amplifiers, Guitar Amps, Tuners, EQs, Turntables, Cassette Decks, Reel to Reels, Speaker repair and Tube Radio Repair. Also most video gear; TV's, Flat Screens including LCD'S, LED screens, DLP, LCOS (Liquid Crystal on Silicon), Plasma, Projection TV's, HDTV's, DSS Satellite Equipment (Digital Satellite Service) repairs, VCR's & DVD players / recorders. They service small and major appliances (white goods) such as washers, dryers, stoves, ranges, refrigerators, dishwashers, mixers, etc. They also carry appliance parts for the 'DIY' folks. They�ve been around since 1983. Specializing in the service and restoration of recent to �Vintage� solid state and vacuum tube audio / stereo equipment. They can repair most any stereo component including; Stereo Receivers, Amplifiers, Tuners, EQs, Turntables, and Tube Hi-Fi. They do all the work �on-site�, rather than �farm out� service as some do� And yes, they speak vinyl too! 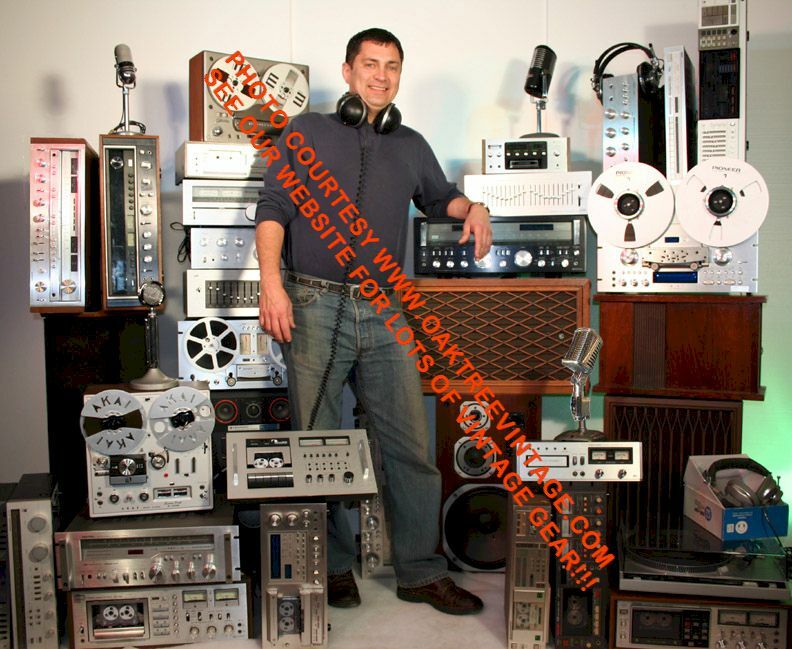 Dan at �Dallas Vintage Audio� can handle most repairs and some restoration / refurb work on about any type of vintage �home� audio / vintage stereo gear including amplifiers, receivers, tuners, EQ�s, reel to reel tape recorder repairs, and some cassette decks. They are also specializing in �Console Stereo� repairs. They are able to accept �shipped in� repairs as well (of course contact them prior to sending unit in for repair). Walk in traffic welcome. Servicing most consumer electronics audio and video equipment both new, recent and vintage. Repairing Stereo Receivers, Amplifiers, Guitar Amps, Tuners, EQs, Turntables, Cassette Decks, Reel to Reels, Speaker repair and Tube Radio Repair. Also most video gear; TV's, Flat Screens including LCD'S, LED screens, DLP, Plasma, Projection TV's, HDTV's, repairs, VCR's both VHS and Beta VCR Repairs, & DVD players / recorders. Also repair most camcorders, Video cameras, digital cameras etc. They also service small and major appliances (white goods) such as washers, dryers, stoves, ranges, refrigerators, dishwashers, mixers, microwaves, bread machines, etc. They can also service some office equipment such as fax machines, copiers, overhead projectors, computers, monitors and more. Recent and Vintage Audio equipment, Tube Gear, Guitar amplifiers, Pro-Audio / PA Gear, Open Reel and Cassette Tape decks, VCR's and Wireless mics. We repair Professional Audio and Video equipment as well. They are a warranty service center for the following brands and more; 3M, Adcom, Advent, Allen & Heath, Ampeg, B-52, Behringer, Boss, Crate, Crown, dbx, Digitech, Dukane, Emerson, ESA, Fender, Fisher, Soundtech, Fujitsu, Funai, G. E., Gallien - Krueger, Go Video, Goldstar, Harman/Kardon, Hartke, Hitachi, Infinity, JBL, Loewe, Jensen, JVC, JVC Professional, Kenwood, Korg, Kurzweil, Kustom, Liesegang, Line 6, Magnavox, Marantz, Marshall, Mesa Boogie, Mitsubishi, Monovision, NEC, Orion, Panasonic, Panasonic Broadcast, Parasound, Philips, Pioneer, Poloroid, Proscan, Proton, Randall, RCA, Roland, Runco, Sampo, Samson, Samsung, Sanyo, Sharp, Sony-Pro, SWR, Sylvania, Symphonic, Tascam, Teac, Technics, Telex, Toshiba, VocoPro, Behringer, Vox, Washburn, Xerox, Yamaha, Yamaha Pro, Zenith. They also stock / sell replacement projection TV / Video projector lamps / bulbs. They Process : Insurance Claims / Moving / Storage Claims when your electronics / stereo gear is damaged. Interwest Electronics Corp., does service on most Modern and vintage Audio, AV, and Video gear from the 1930's to present. They can handle most levels of 'repair' or 'restoration' (yes, there is a difference) on gear, including Cassette Decks, Reel-to-Reel tape decks, VHS & Beta VCR's, Pro-Audio repairs, tube amp biasing for audio and guitar tube amps. They are a McIntosh warranty station for repairs and restoration. They were also a Nakamichi warranty station, so can handle repairs / restoration on your Nakamichi cassette decks as well as most other brands. They also do tube radio repair / restoration. Bob at Action Electronics has been repairing audio / stereo gear at the same location since 1972. He has been working on this type of gear, almost a decade before 'classic audio' was manufactured. I've spoken with Bob a few times, and I can tell, he 'has been around the block', speaking of circuit board details on specific units, that only comes from extensive experience. Stereo Repair and restoration of Vintage / Classic audio including Amplifiers, Tuners, Receivers, Turntables, Reel to Reel and Cassette Tape decks, Speakers, Etc. Also repair of some current audio equipment such as CD / DVD / DAT players. NO video, or TV's. Light Industrial Electronic & Electro-Mechanical Repair, Electronic Troubleshooting and repair at the component level. 'Elite Service'., does service on most Modern and vintage Audio, AV, and Video gear from the 'old to new'. They can handle most levels of 'repair' on gear, including Cassette Decks, Reel-to-Reel tape decks, VHS & Beta VCR's, Pro-Audio repairs, tube amp biasing for vintage & modern 'Mid-Fi' audio and guitar tube amps, as well as tube radio repair. Modern video such as DVD's and Flat-Panel / Plasma TV's and home theater units are no problem. They also sell and install Car Audio and are dealers for brands such as; Alpine, Attrend, Clarion, Kenwood, Infinity, JVC, Lanzar, MTX, Peripheral, Stinger. They repair all makes and models and offer repairs on both recent and 'Vintage' electronics. Servicing most Vintage Stereo / Audio, AV, and Video gear from the 'old to new'. They can handle most levels of 'repair' and some restoration on gear, including receivers, amplifiers, power amplifiers, pre-amps, tuners, Cassette Decks, turntables, Reel-to-Reel tape decks, tube amp biasing for vintage & modern 'Mid-Fi' audio repair. House call / pickup also a possibility. Emergency TV Repair has been doing repairs in the Milwaukee area for over 55 years. They do repair of both modern and vintage audio electronics / stereo gear such as Reel to Reels, Turntables, Cassette Decks, 8-Tracks, Amps, Receivers, CD Players and Changers, Tuner Alignments, Tube gear, Powered Subwoofer repairs, Guitar amps, Pro audio & Tube radio repairs / restoration. They also do microwave oven repair. They do 'house calls' and offer pickup and delivery of repaired units. �The Audio Doctor� at Cowans Audio Service can service most any brand of hi-fi / audio gear such as Accuphase, Arcam , Cambridge, Hitachi, Kenwood, Leak, Luxman, Marantz, Musical Fidelity, Pioneer, Quad, Rogers, Rotel, Sansui, Sony, Yamaha plus more�. and anything from the 1960′s/1970′s/1980′s/1990′s period � Transistor or Valve/Tube � its not a problem for the Audio Doctor. These are links around the US and a few in Canada and abroad that we are aware of that can potentially do repairs on "Vintage" Electronics. Always check them out independently on your own. Some may have the ability to accept shipped units. Know-Audio. offers Repairs of New and Vintage DJ gear, Pro Audio / PA gear / Equipment, DJ / Band Front Line gear. They can also repair / refoam / recone 'Pro-Audio' speakers. Since 1974! From their website, "The best equipped, professionally staffed repair facility in the San Francisco Bay Area with the largest and varied parts department, and service manual library in the business for new and old audio and video equipment, consumer and professional. Complete audio and video repair and calibration on all makes and models. Installation, house and field services available on all products serviced. We service professional, commercial, and consumer equipment from the oldest vacuum tube equipment to the latest state-of-the-art equipment" They can / may offer house-call / delivery / pick-up of your larger items such as console stereos. They specialize in repair of modern and vintage, solid state and tube, Pro-audio electronics, PA gear, mixers, power amps and speakers. 1845 N. Circle Dr. (In the North Circle Plaza) Colorado Springs, CO 80909 Office: 719-630-3533 Ross and his crew have been repairing electronics for over 30 years. I actually used his services on MANY occasions, years ago, when I worked at a 'full line' music / pro-audio store, "The Colorado Springs Music Company". He was our technician for years. Certainly versed in most repairs on 'Pro-Audio' such as power amps, mixers, guitar amps, keyboards, lighting gear, etc. See their web site for more details. They can handle most 'Pro' audio repairs on Analog and Digital Mixers, power amplifiers, signal processors as well as repairs on Wireless Microphone systems, Church and school Sound System Repair as well as repairs on paging systems, karaoke machines & DJ gear. They are able to do repairs on most Modern and Vintage Keyboards, electric pianos, synthesizers and portable organs. Are able to handle 'shipped in' repairs. Link to their web site for more info. Specializing in repair of vintage electronics and stereo gear such as Reel to Reels, Turntables, Amps, Tube gear, Guitar amps, Pro audio. Jeff has been doing Electronic Warranty work since 1980. Midwest Audio' has been servicing electronic equipment for over 30 years. They can do most repairs on consumer and pro audio gear, as well as some video. They also can repair keyboards, both 'home' and 'pro' and keyboard amps. Martroy Electronics, Inc. offers Repairs and sales of New and Vintage DJ gear, Pro Audio / PA gear / Equipment, DJ / Band stage lighting, dimmer packs, lighting controllers and 'disco lights' and are dealers for DJ gear by Numark, American DJ and Stanton. They also can make repairs to Karaoke equipment and systems. Broadway Music offers Repairs, installation and sales of Pro Audio / PA gear / Equipment, Guitars, Keyboards & Amps. They are also able to get speakers Re-foamed / Re-coned as well as upgrading / re-biasing tubes in your favorite guitar amp. They can also make most repairs on Leslie speakers. They can do repair of 'Pro' electronics such as mixers, signal processors, power amps and PA speakers, microphones and cables, snake repairs etc. They also accept 'shipped-in' repairs (contact them first). If it has 'keys', Nick's can probably service / repair / restore it including Hammond Tone wheel organs such as Hammond B3's, C3's etc, pipe organs, pump-reed / field chaplain organs, vintage and modern analog / digital organs, modern digital synthesizers, by Roland, Korg, Yamaha, Kurzweil etc. Electric pianos by Rhodes, Wurlitzer, and keyboards Farfisa, Cumar, ARP, Moog, Piano rebuilding / restringing / refinishing from studio thru grands, and QRS piano to player piano conversions. They are versed in servicing the following items and more: Power Amplifiers - DJ turntables & CD players -Mixers / Mixing Boards / Consoles - PA Gear / Systems - Karaoke machines - Tube Amps - Compact Disc - Laser Disc Players. They are authorized to service the following manufacturers of �Pro-Audio Electronics�: Allen&Heath - Ampeg - Architechtural Acoustics - B-52 - Boss - Budda - Casio - Crate - Crown - Eden - Edirol - EVH - Fender - Fostex - GallienKrueger - Genz Benz - Gretsch Amps - Groove Tubes - Korg - Kurzweil - Kustom - KV2audio - Line6 - Mackie- Marshall - Nord - Novation - Orange - Peavey - Pioneer Pro - PVDJ - QSC - Randall - Rane - Rocktron - Roland - SoundTech - SWR - Tapco - Tascam - Technics - T.L.Audio - Trace Elliot - Vestax - Vocopro - Vox - Wharfedale Pro - Yamaha Pro. They have serviced over 550 manufacturers! They back their repairs with a warranty. See their website for details and further contact info. They have been servicing audio and video gear since the mid 1950's! They can do 'some' work on older keyboards and synthesizers. Can offer home pickup (especially handy for 'console stereo repairs'). They are also able to do 'shipped in' repairs. You will need to contact them first before sending anything for repair to get an idea if they want to 'tackle' it. Minnesota, Lakeville "Pro Audio Service" www.pro-audioservice.com Specializes in Pro Reel to Reel tape deck repair / restoration. Also Vintage 2-Channel Audio & Guitar Amps (solid state and tube), Mixing Consoles, Effects. They can handle most 'Pro' audio repairs on Analog and Digital Mixers, power amplifiers, signal processors as well as repairs on Wireless Microphone systems, Church and school Sound System Repair as well as repairs on paging systems, karaoke machines & DJ gear. They also accept 'shipped-in' repairs (contact them first). See their web site for more details. Professional repairs on Pro-Audio equipment / Keyboards / Synthesizers / Guitars / Guitar Effects repair / Drums / Digital Musical Instruments / Guitar Amplifiers / Amp Tube Biasing and Repair. �Volume Electronics, LLC� We repair all makes and models and offer repairs on both recent and 'Vintage' electronics. Servicing on Pro-Audio equipment / Keyboards / Synthesizers / Guitars / Digital Musical Instruments / Guitar Amplifiers / Amp Tube Biasing and Repair. Lightening strike repairs as well. 'Shipped-In' repairs are also possible with advance notice. Servicing / Repairing primarily 'Pro-Audio' / Touring Equipment / Back-Line Gear such as Power Amplifiers - -Front of House, Monitor & Recording Mixers / Mixing Boards / Consoles - PA Gear / Systems, Guitar Amps, Bass amplifiers, keyboard amps, etc. Ohio, Cleveland, 'RAMHOG SOUND CO.' Phone: 216-518-0288 ramhog5@aol.com Ramhog Sound has a long history of doing repairs on Pro-Audio equipment / Keyboards / Synthesizers / Guitars / Digital Musical Instruments / Guitar Amplifiers / Amp Tube Biasing and Repair. They are also a 'Back-Line' rental company. Tim at Retro Linear, repairs most 'Analog-based' keyboards including Vintage electronic pianos such as Rhodes & Wulitzers, Hohner Clavinets, Hammond / tone-wheel organs, Leslies & Leslie Pre-Amps. Again, many Vintage keyboards, and VINTAGE Analog synthesizers. Also do some repair of 'Pro-Audio' and tube guitar amp biasing. Again, primarily 'Analog' / 'NON-DIGITAL / 'Non-modern' based gear. Servicing most consumer and 'Professional' electronics audio and video equipment both new, recent and vintage. Repairing Tube Gear, Guitar amplifiers, Pro-Audio / PA Gear, and Wireless mics. They are a warranty service center for the following brands and more; 3M, Adcom, Allen & Heath, Ampeg, B-52, Behringer, Boss, Crate, Crown, dbx, Digitech, Dukane, ESA, Fender, Soundtech, Gallien - Krueger, Hartke, Infinity, JBL, Loewe, Jensen, JVC, JVC Professional, Korg, Kurzweil, Kustom, Liesegang, Line 6, Marshall, Mesa Boogie, Panasonic Broadcast, Randall, Roland, Runco, Samson, Sony-Pro, SWR, Tascam, Teac, Telex, VocoPro, Vox, Washburn, Xerox, Yamaha Pro. They also stock / sell replacement projection TV / Video projector lamps / bulbs. They Process : Insurance Claims / Moving / Storage Claims when your electronics / stereo gear is damaged. If you need fast, professional and affordable repair service for any of your media equipment, United VTR Service is the only name you need to know. At United VTR Service, we offer professional, factory-authorized service on most brands of equipment. Non-warranty repair also. Emergency TV Repair has been doing repairs in the Milwaukee area for over 55 years. They will repair many modern keyboards / synthesizers, as well as 'pro audio'. They do 'house calls' and offer pickup and delivery of repaired units. 1845 N. Circle Dr. (In the North Circle Plaza) Colorado Springs, CO 80909 Office: 719-630-3533 Ross and his crew have been repairing electronics for over 30 years. I actually used his services on MANY occasions, years ago, when I worked at a 'full line' music / pro-audio store, "The Colorado Springs Music Company". He was our technician for years. One of their technicians specializes in Hammond / Tone-wheel & Leslie repairs. See their web site for more details. Leslie speaker amp repair. Also Specializes in Pro Reel to Reel tape deck repair / restoration. Also Vintage 2-Channel Audio & Guitar Amps (solid state and tube), Mixing Consoles, Effects. Servicing / Repairing primarily 'Pro-Audio' / Touring Equipment / Back-Line Gear as well as repairs to Hammond 'Tone-Wheel' organ, such as B3's, C3's and A100's as well as Leslie speaker repair. Ramhog Sound has a long history of doing repairs on Pro-Audio equipment / Keyboards / Synthesizers / Guitars / Digital Musical Instruments / Hammond Organs / Leslie Speakers Service / Guitar Amplifiers / Amp Tube Biasing and Repair. They are also a 'Back-Line' rental company. Servicing most consumer electronics audio and video equipment both new, recent and vintage. Repairing Stereo Receivers, Amplifiers, Guitar Amps, Tuners, EQs, Turntables, Cassette Decks, Reel to Reels, Speaker repair and Tube Radio Repair. Also most video gear; TV's, Flat Screens including LCD'S, LED screens, DLP, Plasma, Projection TV's, HDTV's, repairs, VCR's both VHS and Beta VCR Repairs, & DVD players / recorders. Also repair most camcorders, Video cameras, digital cameras etc. They also service small and major appliances (white goods) such as washers, dryers, stoves, ranges, refrigerators, dishwashers, mixers, microwaves, bread machines, etc. They can also service some office equipment such as fax machines, copiers, overhead projectors, computers, monitors and more. Recent and Vintage Audio equipment, Tube Gear, Guitar amplifiers, Pro-Audio / PA Gear, Open Reel and Cassette Tape decks, VCR's and Wireless mics. We repair Professional Audio and Video equipment as well. They are a warranty service center for the following brands and more; 3M, Adcom, Advent, Allen & Heath, Ampeg, B-52, Behringer, Boss, Crate, Crown, dbx, Digitech, Dukane, Emerson, ESA, Fender, Fisher, Soundtech, Fujitsu, Funai, G. E., Gallien - Krueger, Go Video, Goldstar, Harman/Kardon, Hartke, Hitachi, Infinity, JBL, Loewe, Jensen, JVC, JVC Professional, Kenwood, Korg, Kurzweil, Kustom, Liesegang, Line 6, Magnavox, Marantz, Marshall, Mesa Boogie, Mitsubishi, Monovision, NEC, Orion, Panasonic, Panasonic Broadcast, Parasound, Philips, Pioneer, Poloroid, Proscan, Proton, Quasar, Randall, RCA, Roland, Runco, Sampo, Samson, Samsung, Sanyo, Sharp, Sony-Pro, SWR, Sylvania, Symphonic, Tascam, Teac, Technics, Telex, Toshiba, VocoPro, Behringer, Vox, Washburn, Xerox, Yamaha, Yamaha Pro, Zenith. They also stock / sell replacement projection TV / Video projector lamps / bulbs. They Process : Insurance Claims / Moving / Storage Claims when your electronics / stereo gear is damaged. They can repair of modern and vintage audio / video electronics and stereo gear such as Reel to Reels, Turntables, Cassette Decks, 8-Tracks, Amps, Receivers, Tuner Alignments, Tube gear, Guitar amps, Pro audio, Tube radio repairs / restoration, VCR�s, DVC Player�s, TV�s, Short Wave, CB & Ham radio equipment. They specialize in repair of Tube gear, Tube radio repairs / restoration / refurbishment, some Speaker Repair, Some Short Wave, CB & Ham radio equipment. They can / may offer house-call / delivery / pick-up of your larger items such as jukeboxes and console stereos. Since 1974! From their website, "The best equipped, professionally staffed repair facility in the San Francisco Bay Area with the largest and varied parts department, and service manual library in the business for new and old audio and video equipment, consumer and professional. Complete audio and video repair and calibration on all makes and models. Installation, house and field services available on all products serviced. We service professional, commercial, and consumer equipment from the oldest vacuum tube equipment to the latest state-of-the-art equipment" They can / may offer house-call / delivery / pick-up of your larger items such as console stereos. They can generally repair most antique / vintage tube radios and some stereo consoles. Midwest Audio' has been servicing electronic equipment for over 30 years. They service professional, commercial, and consumer audio and video products. They can do most repairs on consumer and pro audio gear, as well as some video. They do not 'shy away' from 'vintage audio' repairs, including old, vintage audio, including antique / tube radios. Specializing in repair & 'Restoration' Tube audio repairs & Tube radios as well as most other audio / electronics repairs.They also accept 'shipped-in' repairs (contact them first). They have been servicing audio and video gear since the mid 1950's! They are able to repair most old radios, especially 'tube radios' and even work on the 'post war German / Austrian Tube Radios' by brands such as; Blaupunkt, Grundig, Nordeman, Philips, Saba, Siemens, Telefunken, etc�. They can offer home pickup (especially handy for 'console stereo repairs'). They are also able to do 'shipped in' repairs. You will need to contact them first before sending anything for repair to get an idea if they want to 'tackle' it. After years in the biz, The folks at ''Birmingham Television Co., Inc" are able to do repairs on most types of classic / vintage audio as well as modern 'mid-Fi', 'Hi-Fi' and 'Audiophile' AUDIO gear including repair of antique tube radios / stereos. They are also able to work / repair console stereos with pick-up and / or house call service available. Member of NESDA. Servicing / Repairing vintage and antique radios, phonographs, turntables. Solid State or Tube. In some instances, they can do local pick-up / delivery on those old 'console / cabinet' radios / stereos. They can typically accept 'shipped in' units for repairs. Contact them first. Since 1969, Millard Electronics, Inc. offers repairs, modification and possible 'restoration' of antique & vintage tube radios, phonographs / record players and Speakers. Able to accept 'shipped-in' repairs. Link to their web site for more info. TelRad Service repairs recent and 'Vintage' electronics, including vintage / antique tube radio repairs and restorations and console stereo repairs. They may even have 'pickup' available for larger units. G.E.H. Electronics Service repairs recent and 'Vintage' electronics, offering service to the Wilson / Buffalo area. They can accept 'shipped in' repairs as well as 'walk-ins' with appointment. They are able to repair or restore most tube radios and audio. �Volume Electronics, LLC� We repair all makes and models and offer repairs on both recent and 'Vintage' electronics. They are able to do most repairs on tube and antique radios. Lightening strike repairs as well. 'Shipped-In' repairs are also possible with advance notice. The folks at 'The AudioWright Shop' shop are able to do restoration / repairs on most antique / vintage tube radios. They also accept repairs shipped to our location from anywhere in the United States. They also make 'house calls' for electronic service, so no need to lug that console stereo in. �Classic Sound Repair� Service repairs recent and 'Vintage' electronics, offering service on most Vintage Stereo / Audio, AV, and Video gear from the 'old to new'. They can handle most repairs and some restoration on antique, tube radios. 'Shipped in' repairs possible as well. Besides servicing Pro & Prosumer camcorders / video camera repairs, LCD & DLP projectors, TVs, projection TVs, VCRs, DVD, all audio receivers, overhead projectors and most A/V equipment for professional and consumer customers. Also repair most cassette tape decks, reel to reels and turntables. They can repair and restore most 'American' Tube Radios (no German tube radio repair & I don't blame them, they're a nightmare to work on). Dan at �Dallas Vintage Audio� can handle most repairs and some restoration / refurb work on about any type of vintage / antique tube radio. They are also specializing in �Console Stereo� repairs. They are able to accept �shipped in� repairs as well (of course contact them prior to sending unit in for repair). Walk in traffic welcome. Jay has been repairing Antique Radios and Tube Amplifiers for 30 years, repairing over 1,400 radios/tube amplifiers for individuals, collectors, museums and antique stores. He primarily works on 'pre-1950's' radios / consoles. A few of the tube amplifiers he has repaired includes; Calrad, Dynaco's Dynakit ST-70, EICO HF-89, Fisher 400C, X100-B, 510-ST, 30-A, Harmon Kardon (HK) A500, Heathkit EA-3, W4AM, Stereo Amp, Knight KN-330 (Tuner/amp), Marantz 7A, RCA MI-12224 (Early PA amplifier), Realistic 201 and likely others. Jay can also repair many antique / vintage car tube AM radios. Most of his repairs will come with a warranty. Bob at Action Electronics has been repairing audio / stereo gear at the same location since 1972. He has been working on this type of gear, almost a decade before 'classic audio' was manufactured. I've spoken with Bob a few times, and I can tell, he 'has been around the block', speaking of circuit board details on specific units, that only comes from extensive experience. Stereo Repair and restoration of Vintage / Classic audio including Speakers, Etc. Repair, modification and restoration of vintage and modern Guitars, both Acoustic and Electric Guitars, as well as repairs / restoration of mandolins, banjos, ukuleles, violins, cellos, upright basses (bass violin), lap steels, Dobros, resonator guitars etc. Re-Fretting / Fret dressing, Neck repairs / neck re-setting, crack repair etc. Pretty much anything with strings. Able to accomplish most of the duties of a guitar luthier including Repair, modification and restoration of vintage and modern Guitars, both Acoustic and Electric Guitars, including Re-Fretting / Fret dressing, Neck repairs / neck re-setting, crack repair etc. Pretty much anything except refinishing. He must be good as he's currently the 'guitar tech' for Pat Benetar, and was previously on tour as guitar tech for John Fogherty. Acoustic Guitar repair, Uke and some electric guitar repair. Repair, modification and restoration of vintage and modern Guitar / Bass / Keyboard amplifiers, either solid state or tube amps. Can also replace tubes and re-biasing as well as repair Effects pedals and rack effects processors. They specialize in repair of modern and vintage, solid state and tube, Tube gear, Guitar amps, Pro audio. Repair, modification and restoration of vintage and modern Guitar / Bass / Keyboard amplifiers, either solid state or tube amps. Can also replace tubes and re-biasing as well as repair Effects pedals. Able to accomplish most of the duties of a guitar luthier including Repair, modification and restoration of vintage and modern Guitars, both Acoustic and Electric Guitars, including Re-Fretting / Fret dressing, Neck repairs / neck re-setting, crack repair etc. Pretty much anything except refinishing. He must be good as he's currently the 'guitar tech' for Pat Benetar, and was previously on tour as guitar tech for John Fogherty. Servicing Stereo Amplifiers, Guitar Amps, EQs, Turntables, Cassette Decks, Reel to Reels, Speaker re-coning / re-foaming. 1845 N. Circle Dr. (In the North Circle Plaza) Colorado Springs, CO 80909 Ross and his crew have been repairing electronics for over 30 years. I actually used his services on MANY occasions, years ago, when I worked at a 'full line' music / pro-audio store, "The Colorado Springs Music Company". He was our technician for years. They are well versed in about any guitar amplifier repair you could seek, including tube work. See their web site for more details. These guys can handle repairs on most Guitar, Bass & Keyboard Amplifiers including replacing tubes and re-biasing as well as repair Effects pedals and rack effects processors. Are able to handle 'shipped in' repairs. Link to their web site for more info. Specializing in Vintage audio repairs. They can repair most guitar, bass and keyboard amplifiers. Solid state or tube. Fenders, Gibsons, Marshalls etc. Need your amps tubes updated / replaced and re-biased...then give them a call. They also can repair guitar / bass and keyboard amps. Specializing in repair & 'Restoration' of vintage & more recent guitar amps as well as speaker re-foaming and re-coning. They can replace and re-bias tubes in your guitar amp, new or vintage. They also accept 'shipped-in' repairs (contact them first). Sunny Electronics offers Repairs of Newer guitar / bass / keyboard amplifiers. These guys can handle repairs on most Guitar, Bass & Keyboard Amplifiers including replacing tubes and re-biasing as well as repair Effects pedals and rack effects processors. Are able to handle 'shipped in' repairs. Link to their web site for more info. They have serviced over 550 manufacturers! They back their repairs with a warranty. See their website for details and further contact info. They have been servicing audio and video gear since the mid 1950's! They are able to repair most guitar amps whether they are solid state or tube. Mike at Sound Advice has been working with 'Vintage Audio' gear before it was "Vintage", starting in the late 1960's. They can replace and re-bias tubes in your guitar amp, new or vintage as well as speaker re-foaming and re-coning. They also accept 'shipped-in' repairs (contact them first). Missouri, Overland Park / K.C. "The Electronic Center / K.C. Stereo Repair" www.kcstereorepair.com 7113 W 79th | Overland Park, KS 66204 PH: 913-649-5000 "They have been servicing stereo / audio / video gear for over 30 years! Experienced in repair of vintage electronics repair in the Kansas City metro area. Repair services & restoration of vintage and new guitar / bass / keyboard amps, solid state or tube. Can also re-bias your amp for any tube changes as well. Since 1969, Millard Electronics, Inc. These guys can handle repairs on most Guitar, Bass & Keyboard Amplifiers including replacing tubes and re-biasing as well as repair Effects pedals and rack effects processors. Are able to handle 'shipped in' repairs. Link to their web site for more info. Repair, modification and restoration of vintage and modern guitar and MI amplifiers. Able to accept 'shipped-in' repairs. �Volume Electronics, LLC� We repair all makes and models and offer repairs on both recent and 'Vintage' electronics. Servicing most guitar amps both tube and solid state. Lightening strike repairs as well. 'Shipped-In' repairs are also possible with advance notice. Servicing / Repairing primarily 'Pro-Audio' / Touring Equipment / Back-Line Gear and repairs to most Guitar amps, Bass amps and Keyboard Amplifiers. �Classic Sound Repair� Service repairs recent and 'Vintage' electronics, including solid state and tube guitar, bass and keyboard amps. They sometimes have �house-call� / 'pick-up' available to service that old console stereo as well. 'Shipped-In' repairs are also possible with advance notice. Dan at �Dallas Vintage Audio� can handle most repairs and some restoration / refurb work on about any type of modern or vintage solid state or tube guitar / bass amplifier. If you need to change output tubes and get the unit 're-biased' they can handle that. They are able to accept �shipped in� repairs as well (of course contact them prior to sending unit in for repair). Walk in traffic welcome. Emergency TV Repair has been doing repairs in the Milwaukee area for over 55 years. They do basic repairs to guitar and bass amps, tube or solid state. They can also 're-bias' your tube guitar amp. They do 'house calls' and offer pickup and delivery of repaired units. Professional repairs on Pro-Audio equipment including guitar, bass and keyboard amps / amplifiers. Brands service include, but aren't limited to; Orange, Vox, Marshall, Laney, Ampeg, Fender and most others. �. and anything from the 1960′s/1970′s/1980′s/1990′s period � Transistor or Valve/Tube � its not a problem for the Audio Doctor. They repair modern and vintage audio / video electronics and stereo gear such as Reel to Reels, Turntables, Cassette Decks, 8-Tracks, Amps, Receivers, Tuner Alignments, Tube gear, Guitar amps, Pro audio, Tube radio repairs / restoration, VCR�s, DVC Player�s, TV�s, Short Wave, CB & Ham radio equipment. Since 1974! From their website, "The best equipped, professionally staffed repair facility in the San Francisco Bay Area with the largest and varied parts department, and service manual library in the business for new and old audio and video equipment, consumer and professional. Complete audio and video repair and calibration on all makes and models. Installation, house and field services available on all products serviced. We service professional, commercial, and consumer equipment from the oldest vacuum tube equipment to the latest state-of-the-art equipment" They can / may offer house-call / delivery / pick-up of your larger items such as console stereos. They can repair most 'modern' A/V gear such as Plasma, LED and LCD, flat panel TV's as well as DVD players, DVR's and VCR's. From their website, "ISF Professional Imaging services to make your direct view, front or rear projection or LCD, plasma, or DLP monitors look better than they did when they were new, or new equipment better than it does right out of the box. This is an art form and is completely different from service and repair. We have a Security Division Department which services all types of CCTV equipment, time lapse VCRs, DVRs, Monitors, Multi-plexers, cameras, and all types of video displays, LCD, DLP, plasma, 3 tube, or direct view." Since 1992 offering repairs of Television, Video Camera, VCRs VHS and Beta, and now Big Screens, HDTV, Plasma, LCD, Flat Panel, DLP, or traditional CRT TVs. Mobile capable for in-home house calls / on-site / repairs. See their web site for more details. Specializing in repair of VCR�s, DVC Player�s, TV�s, and most video equipment. Jeff has been doing Electronic Warranty work since 1980. Repairs of modern and Vintage audio / Stereo / Video repairs. They can repair DLP, LED, LCD, PLASMA and Projection TV's. From their website; "We offer factory authorized service for brands such as Hitachi, Optelec, Panasonic, PDI, RCA, Sharp, Sanyo & Viore. Sound Technology is also an authorized servicer for many extended warranty providers such as AIG, Global Warranty Group, NEW, & Servicenet." Sunny Electronics offers Repairs of newer A/V gear such as flat panel LCD / LED TV's. Prompt Service at our shop / store, or we also feature �In-Home Service�. Your headquarters for Sharp, Panasonic, Sony, Samsung, and Pioneer! We now carry Onkyo products as well! Celebrating 39 years, and we are a �4th generation� business! They have been servicing audio and video gear since the mid 1950's! Capable of repairs on most TV's, DVD's and VCR's, including DLP, LED / LCD, PLASMA, etc... They repair some computers, and offer repair of some computer monitors as well. They can offer home pickup (especially handy for 'console stereo repairs'). They are also able to do 'shipped in' repairs. You will need to contact them first before sending anything for repair to get an idea if they want to 'tackle' it. After years in the biz, The folks at ''Birmingham Television Co., Inc" are able to do repairs on most types of classic / vintage audio as well as modern 'mid-Fi', 'Hi-Fi' and 'Audiophile' AUDIO gear including CD players, DAT decks etc and video gear such as repairing Beta and VHS VCR'S and Video Laser Disc players. With pick-up and / or house call service available. Member of NESDA. We are an independent service company which can handle all your consumer electronics servicing needs in the Grand Rapids area. We are a factory authorized service center for most major brands, and service almost all brands which are not under a factory warranty. Our road service area covers most of Western Michigan, including Grand Haven, Greenville, Gun Lake, Hastings, Holland, Howard City, Muskegon, Sparta, Wayland and anywhere in between. We stock the parts you need. Our inventory consists of all the popular parts to repair today's consumer electronics as well as those of yesteryear. If your looking for the hard to find part, give us a call. Sales and service on The Newest Widescreen Flat TV's, Plasma, LCD, LED, and 3D TV's DVD Recorders/Players Blu-ray Players Audio Systems Home Theater Systems Service on Plasma - DLP's - LCD's - CRT - TV's - Computer Monitors and Touch Screens. They can even service film projectors. After 72 years in the biz, the folks at ''Northern-TV' shop offers repairs of Television, 8mm & VHS Video Camera's, VCR's both VHS and Beta VCR Repairs, & DVD players / recorders, and now Big Screens, HDTV, Plasma, LCD, Flat Panel, DLP, or traditional CRT TVs. Servicing / Repairing Stereo Receivers, Amplifiers, Tuners, EQs, Turntables, Cassette Decks, Reel to Reels, and most 'quality / vintage' and 'recent' consumer audio equipment. Also service Video gear such as Beta VCR's, VHS as well as TV's, Flat Screens and DVD players. In some instances, they can do local pick-up / delivery. They can typically accept 'shipped in' units for repairs. Contact them first. Missouri, Overland Park / K.C. "The Electronic Center / K.C. Stereo Repair" www.kcstereorepair.com 7113 W 79th | Overland Park, KS 66204 PH: 913-649-5000 "They have been servicing stereo / audio / video gear for over 30 years! Experienced in repair of vintage electronics repair in the Kansas City metro area. Repair services & restoration of vintage and modern VHS video recorders (sorry no Beta VCR repairs). Since 1969, Millard Electronics, Inc. offers repairs of Television, 8mm & VHS Video Camera's, VCR's both VHS and Beta VCR Repairs, & DVD players / recorders, and now Big Screens, HDTV, Plasma, LCD, Flat Panel, DLP, or traditional CRT TVs. Mobile capable for in-home house calls / on-site / repairs. See their web site for more details. TelRad Service repairs most brands and models of Plasma, LCD, LED Televisions, Flat Screen as well as projection types and we still repair older model CRT based TVs and Projection TVs. �Volume Electronics, LLC� We repair all makes and models and offer repairs on both recent and 'Vintage' electronics. Servicing most video gear; TV's, Flat Screens including LCD'S, LED screens, DLP, LCOS (Liquid Crystal on Silicon), Plasma, Projection TV's, HDTV's, DSS Satellite Equipment (Digital Satellite Service) repairs, VCR's (VHS AND BETA) & DVD players / recorders. Lightening strike repairs as well. 'Shipped-In' repairs are also possible with advance notice. As well as 'classic / vintage' audio repairs, they are able to repair most 'modern' audio / video gear including A/V Receivers / Amps, Home Theater gear, Flat-Panel TV's, LED / LCD / Projection screens / monitors, as well as VCRs (VHS and Beta VCR repairs), DVD players and CD players repaired. They sometimes have �house-call� / 'pick-up' available to service that old console stereo as well. 'Shipped-In' repairs are also possible with advance notice. We service Pro & Prosumer camcorders / video camera repairs, LCD & DLP projectors, TVs, projection TVs, VCRs, DVD, all audio receivers, overhead projectors and most A/V equipment for professional and consumer customers. Also repair most cassette tape decks, reel to reels and turntables. They can repair most modern 'high end' video cameras with HD / DVD. If you need fast, professional and affordable repair service for any of your media equipment, United VTR Service is the only name you need to know. At United VTR Service, we offer professional, factory-authorized service on most brands of equipment. Non-warranty repair also. TV / Big Screen / Flat Screen TV Repair, VCR / DVD / Blu-Ray Player / Camcorder Repair, Vintage and Recent Stereo / Audio /Video Equipment Repair, Computer & Monitor Repair. Burke Electronics does service on most Audio-Video / AV gear from VCR's to DVD's, and TV's from 'tube' to LCD / LED / PLASMA. They repair all makes and models and offer repairs on both recent and 'Vintage' electronics. Servicing most Vintage Stereo / Audio, AV, and Video gear from the 'old to new'. Modern video such as DVD's and Flat-Panel / Plasma TV's and home theater units are no problem. Plasma, LCD, DLP & CRT TVs - VCRs & Camcorders. Repairing brands such as; Aiwa, Akai, Denon, Emerson, Funai, Harmon Kardon, Hitachi, JVC, LG, Mitsubishi, Panasonic, Philips/Magnavox, Pioneer, RCA/GE, Samsung, Sansui, Sanyo, Sharp, Sony,Toshiba, Visio, Westinghouse, Yamaha, Zenith and most others. House call / pickup also a possibility. Wisconsin, Milwaukee, 'Emergency TV Repair' www.emergencytvservice.com Hours: Weekdays 9 a.m.-6 p.m.; Saturdays 9 a.m.-3 p.m. Emergency TV Repair has been doing repairs in the Milwaukee area for over 55 years. They do repair of both modern and older A/V gear including All makes of televisions � Big screen LCD, Plasma, DLP, as well as repairs to Video Games / consoles, DVDs, VCRs including VHS / BETA / 8mm repairs, Camcorders including VHS, VHS-C, BETA-CAM's / BETA-MOVIES, and 8mm camcorder repairs, as well as modern camcorders. They do 'house calls' and offer pickup and delivery of repaired units. They have been servicing audio and video gear since the mid 1950's! Capable of repairs on 'vintage' car radios, and stereos, especially from the 1950's thru the '70's. They are also able to do 'shipped in' repairs. You will need to contact them first before sending anything for repair to get an idea if they want to 'tackle' it.